This was a Sunset Cruise with a difference. 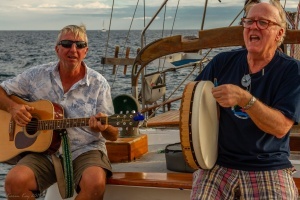 We had a group approach us for an exclusive cruise with no musicians – they wanted to bring their own and sing Sea Shanties! What fun we had, songs for pulling out sails and songs for pulling them in again. Stuart was even invited for a guest appearance!